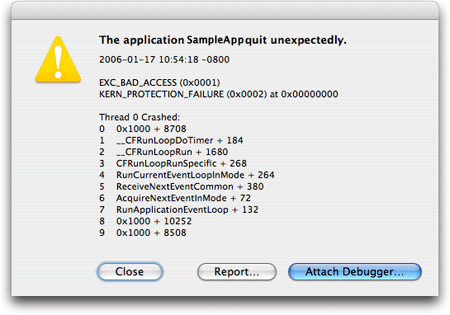 If you’ve ever had an OS X application quit on you, you’ve probably seen the CrashReporter dialog box—even if you didn’t recognize it as such at the time. The CrashReporter dialog box gives you the option to close the dialog box, reopen the program in question, or report the problem to Apple. While this is handy, there are times when you might want either more or less information regarding a crashed application. Ted Landau showed you how to do this using Property List Editor, one of Apple's Developer Tools installed from your Tiger installation DVD. Here we’ll use Terminal to do the same thing more quickly and explain a couple of additional reporting options available. While this information may not be meaningful to most of us, it could help the developer figure out what’s causing the crash. This changes the CrashReporter setting to “server” mode; you won’t see the dialog box at all. Instead, all crash data will be written into a CrashReporter log file, which you can then browse using the Console program (in Applications/Utilities). With three different settings for the CrashReporter dialog box, hopefully there’s one here that meets your needs.